I admit it. I’ve been aÂ cat-lover for some time, now. Fortunately, there’s beenÂ aÂ prince in the house to feed that craving and his name is Chauncey (as in, Billups). He’s wonderful. Playful, curious, vocal, inquisitive, nocturnal. Black (with a couple white hairs here and there), sleek, shiny, long-tailed, agile. Has to have his paws on everything. He belongs to my roommate, yet has a special place reserved in my heart. I’ve wanted my own cat. I just haven’t admitted it to myself enough to commit. Perusing lolcats on ICanHasCheezburger.com, sure. 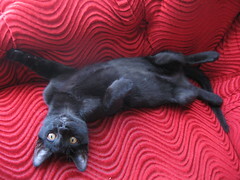 Voting for the cutest kitteh on Kittenwar.com, sure. Playing with Chaunce when I get home from work (as all kittens should be played with everyday), sure.Â Scooping litter, takingÂ in for check-ups, mandatory play-time–not so much for me. I’ve been a hypocrite. 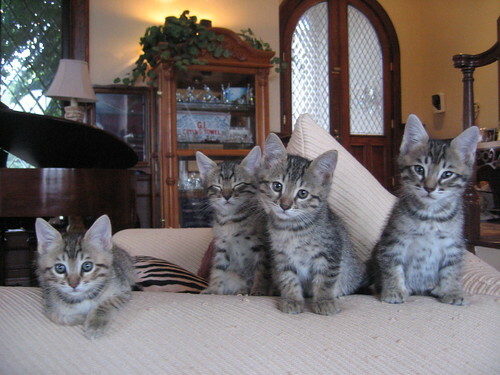 Meet what’s left of my boss’ recent litter of Bengal kittens. Two boys, two girls. The one hilariously “chillin’ on her right paw” on the furthestÂ left is a girl and the one on the furthestÂ rightÂ is a boy. I’m not sure about the middle two but one thing I am certain, that guy was literally falling asleep as I was taking this picture. In fact, he-or-she was kind of teetering from side to side. I figured now that Chauncey is 7 months old, better now than ever to adopt a second kitteh so they have better chances of getting along while Chaunce is young. So I bit the bullet. The one on the furthest right is mine. I don’t have him, yet, as theÂ kittehs are getting theirÂ 8-week shots this week. I should have him in a few days. In the meantime, it’s time to go to PetCoÂ for some basics. His name is Rufus. I’ll call him Roofies for short. To give you an idea of whatÂ what his markings will look likeÂ when he’s older, here’s a picture of one of the kitties (I couldn’t tell which) and his Dad. “Aww” to your heart’s desire. 😀 I couldn’t be more excited or anxious! This entry was posted in In the life, Nerdism, Rufus. Bookmark the permalink.